The new date for recreational cannabis in Canada. While cannabis could be legal for recreational use as early as June 7, Canadians may have to wait several weeks to buy their legal supply. When the bill passes, it could take up to three months before being available retail outlets. Health Minister Ginette Petitpas Taylor said a new date for recreational cannabis in Canada would take between eight and 12 weeks before being available to the public. As long the bill passes in the Upper House and there are no amendments, the earliest it will be available for sale is August. But it could be September before it becomes available. Local provincial governments are saying they need more time more time to prepare. They still need to sort out legal distribution from licenced growers to retailers. Canada is set to make history as only the second country in the world to fully legalise marijuana Uruguay is the first in the world. Yet, there are some concerned about it moving too fast. Establishing a whole new industry, and say it takes time and careful planning. With different laws expected from province to province, this further complicates the situation. In Ontario, only local government will sell cannabis like liquor sales in the area. But, in Colombia, people will have the option of buying cannabis from either government or privately-run retail outlets. Health Canada also needs to share information about the implementation of cannabis to prepare everyone for the new laws. There is still some opposition to legalising recreational marijuana from some areas of Canada. Cities such as Richmond on the coast in British Columbia not far from Vancouver is one. Even though there are still objections, the government does not waver from its agenda. It stays committed to its election promise of legalising cannabis even if it takes a bit longer. With the marijuana bill only on its second reading in the Upper House, they expect witnesses will speak to the bill. It will then go back for further debate and reading for the third time. It is also likely there will be amendments proposed for the bill to pass, which means these have to go back to the House of Commons for approval. This could take weeks if this happens. Conservative Senate Leader Larry Smith said his senators will not cause deliberate delays. But, they will insist on being rigorous in examining the bill. There is also the possibility they could delay debate until they are ready to speak to the content in the bill. Other Independent officials said if that happens there is a procedural tool they can use. They can move the bill to a vote if there are deliberate attempts to prevent its passage. 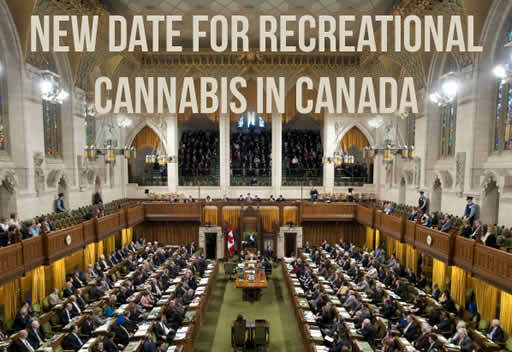 It is currently illegal to transport weed in Canada until the bill has royal assent. And, a formal distribution system needs setting up to move cannabis from the growers around the country. How long this takes depends on the province. Also, staff will need hiring and training to sell cannabis to the pubic. This will not happen overnight even when the bill becomes law. But, Public Safety Minister Ralph Goodale made it clear their goal is cannabis legalisation this summer, but it has to be in an orderly way. When the government announced the delay, Canadian cannabis stock took a hard hit. Canadian producers Canopy Growth lost 6% and MedReleaf lost 8% on the stock market. Some believe these companies already have inflated values up to 200 times more than their revenue. Experts see the cannabis industry as in a bubble that will burst. And, others see it as an opportunity to buy stock while the prices are lower. These stock prices are likely to rise again once legal cannabis hits the streets. No matter how the vote goes, recreational cannabis is set to find a place in mainstream society. Politicians acknowledge that Canadians are consuming cannabis in record levels already, so it is better to legislate to minimise harm. Prohibition did not stop drinking, just as it is not stopping cannabis use. There is no stopping it now, but the devil is in the detail. It will be the details that need sorting out once recreational marijuana becomes law in Canada. And, for that, it could take up to three months after the bill receives royal assent.